Playing favorites with the sultry jazz vocalist. It's one of those questions, like those suffered by veteran actors about how they can memorize those lines. Monheit was gracious in confessing there were too many to count. But, it got me thinking. How about a semi-scientific survey? Could the time given to songs on her albums be any indication? I did the research and presented the findings in our opening dialogue. CRISTOFER GROSS. I watched an interviewer ask your favorite song. Of course you couldn’t single one out. But I've gone through all ten of your recordings and come up with the longest album cuts. GROSS. So, if you don’t know, out of close to 100 tracks, seven run more than six minutes. MONHEIT. That’s funny I was just thinking last night about how my recording of "Over the Rainbow" is really really long. MONHEIT. Well, there’s a reason why it’s that long, actually. It was a rehearsal take. And we were just playing with the tunes, and not thinking like "Okay we have to keep this a certain length" or anything like that. We were just playing music. I don’t think I even knew that Joel Dorn was rolling tape. That was a trick he used to play on me. He’d say "Just sing. I’m not recording. " Then he would, and it would be the best performance. GROSS. It's only the third longest, however. The longest is "It Never Entered My Mind" . . .
MONHEIT. Oh, that’s the longest? Really. GROSS. Yeah. And the second longest is my favorite. You want to guess what it is? MONHEIT. Let me see. "Waters of March? " GROSS. No, it’s one of the two Landesman-Wolf compositions that you have recorded. MONHEIT. Oh, "Spring Can Really Hang You Up The Most." GROSS. There's a Houston Person version with Ron Carter that made me fall in love with that song years ago, and yours is every bit as good. The other Landesman-Wolf song you do, "Ballad of a Sad Man" is also on the list. So you apparently have an affinity with them. MONHEIT. I was young for that song, but I really wanted to do it. GROSS. It sounds legitimate to me. Maybe you're an old soul. MONHEIT. [Laughs] Certainly. And I also think that sometimes a young perspective on a song that’s generally associated with wisdom and that sort of thing can be very, very interesting. To hear a young voice sing as though they had lived and you have this feeling that even though this person might be – and I was probably 23 when I recorded it – has had some experience. Everybody knows how to sing about love. You could be 12 years old and know how to sing about love. It’s all about personal experience. GROSS. So there are definite emotional and tonal similarities between those longer songs. Not that it means they are your favorites. MONHEIT. Oh, I think a lot of them are. And they're songs I still do for the most part. I haven't done "It Never Entered My Mind" for a long time, but I just said to my pianist the other day that I think we should do it again. And I do "Rainbow" every night and I still do "Spring" all the time. GROSS. It was intereting for me that "Never Entered My Mind" ended up being the longest – potentially "favorite" by the survey – because as I was playing your albums one after another, day after a day to saturate before interviewing, when that song came on, i had to stop what I was doing, sit and listen, and then go back and play it again. There was something so direct and intimate about it. And I thought the sax was right there on the same plane with you. MONHEIT. Oh thanks. That's part of the idea, that's what I'm going for. Something that's so honest that you have to pay attention. Was that Joel Frahm? MONHEIT. Yeah, that's why. 'Cause Joel and I . . . It was very common for us to be playing together and both get choked up. He and I had a very special relationship. We've drifted a bit now, but I loved playing with him so much, because it was really, really special. GROSS. Well, he certainly left his mark on that track. MONHEIT. I really believe he's one of the greatest living tenor players. He's got an incredible voice. At any genre, he's unbelievable. GROSS. You say you drifted apart. Did that come when you moved upstate to start the family? MONHEIT. I still live in New York. I live here [upstate] part time and I live in New York [City] part time. But I think I'm going to be moving back to the city full time. My son will be 4 in two weeks [early May 2012]. And my career is changing and I need to be in the city more. For a while we were just constantly on the road and it didn't matter where we lived. But now things are shifting and I'm teaching so much in New York and I'm doing so many other things and side projects that I need to be there more. GROSS. And your son travels with you? MONHEIT. Always. Unless there's some reason why it's not a good idea, and usually that is only when we leave the country. We just went to Japan to do four nights in Tokyo and it's like, well I could turn his world literally upside-down. And he's been doing it since he was a baby but at this age jet-lag is devastating. And he's one of these kids who won't eat any thing. So I take him to Japan at this age and it's like, No honey they can't make a grilled cheese sandwich. You want some Soba noodles. So he stayed with my parents. GROSS. Let's dig into this intimacy area. You told one reporter who asked if you were surprised by how sexual your delivery was that you do look at those tapes in wonder. Like my experience listening to "Never Entered." When you were growing up, did you think you needed to watch how intimate you became? Or did you just let it be what it was? MONHEIT. No, I've always just sort of let it rip. I am my most open self when I sing. And that's what makes me effective I think. I'm sure I don't have the best voice, or the best time . . . GROSS. Well, there are a lot of critics who think you are at the top of the form. MONHEIT. Well, that's all in the ear of the beholder. Everybody responds to the human voice differently, so you can't just rely on sounding a certain way, It's like looking really pretty all the time and having nothing to your personality. I don't want to be a vocal Barbie. At the same time, it's nice to have a pretty voice, there has to be something about it that makes it matter and for me it's that really sincere delivery and just . . . and it's honestly sincere. It's not like I figured out how to sound sincere. But I'm telling you the truth. GROSS. So as a teenager when you did this, were you already connecting with people at this level? MONHEIT. It started as a kid. I don't know why, but for some reason everybody always noticed when I was singing. Then it was probably just because I was a really precocious talented kid. I kinda got good early. I had a lot of skills. I sang in really good tune and have perfect pitch, which is always surprising for a kid. GROSS. So it never entered your mind to modulate that or develop that. It was there naturally. MONHEIT. Well I developed everything, I worked really hard and trained … and tried to be the best singer, the best musician I could, whether with the band, the marching band, the jazz band, the choir, the show choir, and every musical and community theater I could do. I did everything my whole life. Ev ry thing. I'd get home from school at 10 o'clock at night sometimes because I had so much extra curricular music and theater. So I was working really hard. And then I started doing gigs when I was 16, that was . . . GROSS. I realize you had to work on the technical aspects but was speaking about opening up that emotional honesty. MONHEIT. Oh. That was just naturally there, somehow. Also I remember in college Peter Eldridge trying to get me to connect with the lyric more because I was doing so many vocal gymnastics. I went through this phase. . . . You know, when I went to college all of a sudden it was like oh, you're a singer, well you're not a musician go sit in the corner. And it was like excuse me. So I started working really hard to prove myself. Every time I sang a song it was just all over the place and look what I can do. And Peter got me to stop doing that. GROSS. Well I thank him for that. MONHEIT. [Laughs.] Well I had to prove myself to the boys, and to the teachers. GROSS. It says you play piano and clarinet. Do you play well enough to accompany yourself? MONHEIT. No I never do. I'm not a good enough player because I was without a piano for so many years. And I really enjoy being an entertainer. I want to be standing up there behind the mic entertaining everybody. GROSS. Sounds like you did a fair share of theater. MONHEIT. I did a lot when I was younger. I haven't done a show in probably 14 years. It was heartbreak. Straight plays in High School but Community Theater all musicals. I played Dorothy Brock in 42nd Street twice because I was the only one of the young people who could do an old lady voice like this (demonstrates). I played Marion Peru. I did all that stuff and I miss it so desperately. And I've been really close a couple times to getting Broadway roles but it didn't work either time and both times the production ended up being a disaster. GROSS. Does a cabaret series or venue require a slightly different show? MONHEIT. No not at all. I do the same thing everywhere. GROSS. And the audiences are the same? MONHEIT. The audiences are the same because the people that want to hear me find me where I am. And that's really cool. I love a slightly more cabaret audience because their knowledge of the songs is amazing. Like in a jazz club I can sing the verse to the tune and everybody's like "Oh, she's singing the verse, that's cool." And in a cabaret club they know what song it is after I sing three syllables. But I'm in a funny situation where the jazz world thinks I'm a cabaret singer and the cabaret world thinks I'm a jazz singer. So everybody's just like "Oh, well you're everybody else." But I'm pretty much accepted by everyone, especially in the cabaret world. I find that the cabaret world is a really beautiful, supportive wonderful place where the singers really get behind each other. it's like if you go in a cabaret show the room is filled with other singers. And that is so often. I don't do cabaret the way cabaret artists do it. They go full out. I mean there is a show with a title and it's directed by someone and it has a musical director, and an arranger, and there's tons of research done, and the history is known and obscure tunes are found, and stories are told and it's like this in-depth experience, which is so cool. But I come from both worlds. So I appreciate both things, and on my regular show maybe it's a little more cabaret, and then, like last night I played a gig here in town and it was totally a jazz gig where we were just blowing on tunes. GROSS. So, there are differences but it's basically the same. MONHEIT. It's the same – well it's the Great American Songbook, although jazz musicians are straying further and further away from the songbook now. And I have too, but it is sort of my homeland. GROSS. When you add a Joni Mitchell or Fiona Apple song, do you consider they're being slipped into the Great American Songbook or are you leaving the Songbook to go to contemporary singers. MONHEIT. It's like Volume 2. They're great songs, too and they're good enough to go side-by-side with the Great American Songbook. And you can't ignore all the brilliant writers of the second half of the 20th Century and the beginning of our Century. They're amazing writers. Of course I'm going to sing a Stevie Wonder tune. I love Stevie Wonder and I'm sure at some point I'll cover a Beatles tune, I can't believe I haven't yet. And I do tons of Brazilian music too, which is technically not the American Songbook but it goes beautifully hand-in-hand with it. GROSS. Well it may be more like the American listening experience. MONHEIT. Yeah. There you go. It's just good songs. GROSS. By the way I see you do a lot of Duke Ellington songs, but not my favorite, "Beginning to See the Light." MONHEIT. I love that tune. I used to do it at all my gigs, live. GROSS. Well there was a show you probably know as a musical theater person, "Play On" . . .
MONHEIT. Don't get me started on Play On. I was so upset that it closed and nobody understood how killing it was. It was so brilliant. Ellington and Twelfth Night? It was brilliant. An incredible cast. I think maybe the reason it didn't fly so hard in New York is because it wasn't a huge, flashy, expensive production. I think that Play On didn't have that aspect at a time when people were really starting to look for it. GROSS. Tell me about working with Pizzarelli. MONHEIT. It's two separate bands. He'll probably do a duet in my set and I do a duet in his half. We'll probably do two or three songs together. I am a huge fan of John's for everything I've talked about in this interview. He's sincere, you believe him. When he sings you believe him. I love hearing him sing a ballad. He takes genuine joy in the music. He knows the history and he's a hell of an entertainer. GROSS. You're off your one-a-year CD schedule. Is something in development? MONHEIT. Yeah, we're starting to work on it now. You know we slowed it down a lot because I'm a mother now and there's the road. And the record business is just changing so much anyway. And for me my priority is the live show. Album making has never been my priority. The performances are my first priority, after my child. Motherhood is number one. Work cannot get in the way of that. Unless I take my son on the road, and that's great. But motherhood, live show, album are my priorities. GROSS. So you're starting something now. Is there any theme? MONHEIT. Not yet. I haven't met with our producer, I'm using a producer on this one. All I know is we have some tunes in the live show right now that are almost definitely going to go on the record because they're great. Great new stuff. And they're standards. GROSS. And we'll hear some of those when you're out here? MONHEIT. You'll certainly hear them. GROSS. And the album won't be out by then. GROSS. The "Rainbow Connection," the word rainbow – "Over the Rainbow," Rainbow Room, "Rainbow Connection." Does that word have special meaning from childhood or things. MONHEIT. Well, you know, growing up "Over the Rainbow" and "Rainbow Connection" were two of my mega-favorite songs from the time I was tiny. And I still love rainbows. I love rainbow everything. My son colors rainbows for me. It's just an image of hope and beauty and something absolutely pure and magical, that is just a gift from the universe to everyone that just promises hope and magical things. it's just wonderful. And they're great songs. GROSS. That reminds me, in looking at the name of your first album, Never Never Land, it's sometimes written as three words, which made me first think it was about staying up, staying imaginative, keeping the spirit of flight and fancy. That's a nice idea in sync with the rainbows. MONHEIT. Oh what a beautiful idea. I never thought of that. 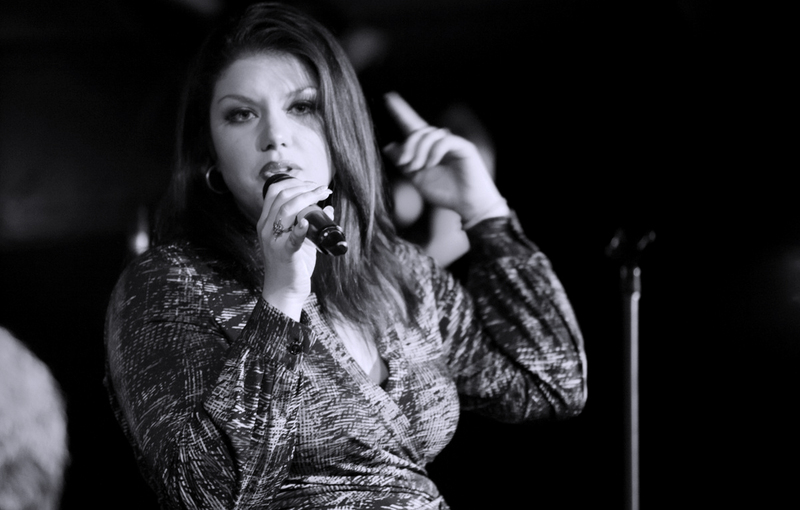 • "It Never Entered My Mind"
Jazz vocalist Jane Monheit celebrates the tenth anniversary of her remarkable recording career with her most mature, heartfelt album yet, Home, a collection of standards that represents a passionate return to her roots as a jazz musician. The CD features the band she has worked with onstage and off for most of her career, as well as special guests such as John Pizzarelli, Mark O’Connor, and Larry Goldings. This is her first album for Emarcy/Universal and also marks her debut as sole producer of a recording.